According to the new market research report Biomaterials Market by Type of Materials (Metallic, Ceramic, Polymers, Natural) & Application (Cardiovascular, Orthopedic, Dental, Plastic Surgery, Wound Healing, Neurology, Tissue Engineering, Ophthalmology) – Global Forecast to 2021, published by MarketsandMarkets, analyzes and studies the major market drivers, restraints/challenges, and opportunities in North America, Europe, Asia-Pacific, and the Rest of the world (RoW). Dont miss out on business opportunities in Biomaterials Market. The global biomaterials market is segmented based on type of material, application, and region. Based on type of material, the global market is segmented into metallic, ceramic, polymeric, and natural biomaterials. 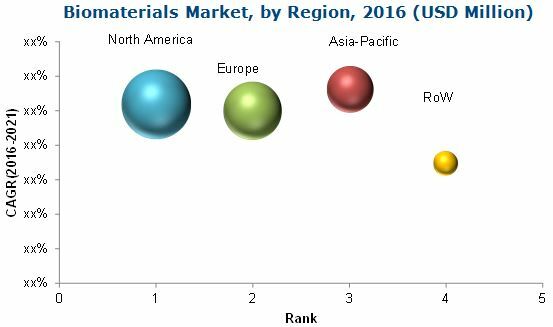 In 2016, the metallic biomaterials segment is expected to account for the largest share of the market. The metallic biomaterials segment is further divided into stainless steel, titanium & titanium alloys, cobalt- chrome alloys, gold, silver, and magnesium. In 2016, the stainless-steel segment is projected to account for the largest share of the metallic market. The titanium and titanium alloys segment is expected to grow at the highest CAGR during the forecast period. The polymeric biomaterials segment is projected to grow at the highest CAGR during the forecast period. Polymeric biomaterials are further segmented into polymethylmethacrylate (PMMA), polyethylene, polyester, polyvinyl chloride, silicone rubber, nylon, polyetheretherketone (PEEK), PLA, PGA, and PLGA, and other polymeric biomaterials. The PMMA segment is expected to grow at the highest CAGR during the forecast period.